Gluten-Free and Vegetarian, this 15 minute salad is a fiesta in a bowl! Perfect by itself of alongside any protein. Quick, Packed with Nutrients & Delish! Fiesta in a bowl! This 15 minute Mexican Chopped Salad is a great salad to have in your repertoire! It’s super quick and easy to make, is packed with a great mix of flavors and textures, and is delish! It is great on its own for lunch or a light dinner, or alongside any protein. We tend to serve it with grilled chicken. 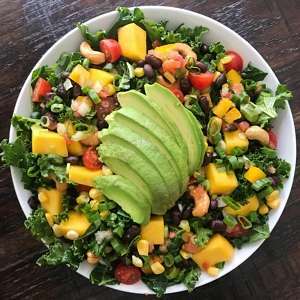 This salad has a little bit of everything and is made with real, whole food ingredients: kale, canned black beans, mango, frozen organic corn, cherry or grape tomatoes, yellow pepper, green onion, avocado, cashews and a simple 3 ingredient Lime Dressing. The combination is super fresh & crowd pleasing! 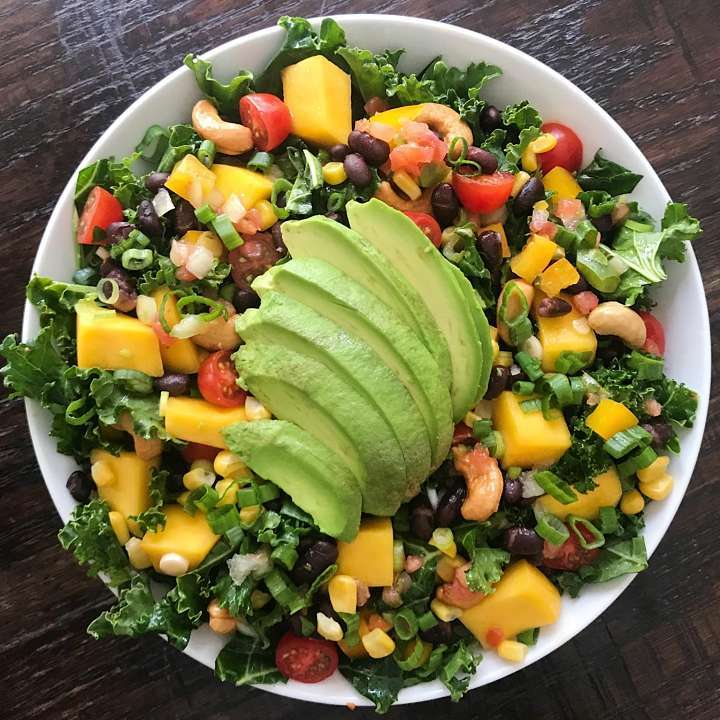 Juice mango, salty crunchy cashews, creamy avo, protein packed black beans, crunchy peppers, juicy tomatoes plus lots of greens. We make it with kale but feel free to substitute your favorite green. The dressing super simple — prepared salsa, lime juice & EVOO — and pulls it all together. Finally as with all our salads, feel free to add more or less of your favorite ingredients! Recipe adapted from one my mom found in a local newspaper several years back. Gluten-Free and Vegetarian, this 15 minute salad is a fiesta in a bowl! 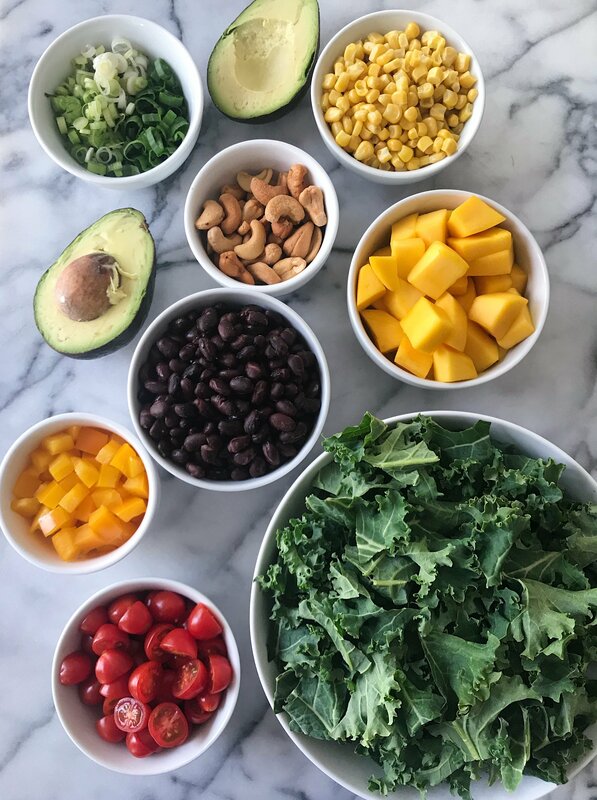 Perfect by itself of alongside any protein, this super easy salad that has a little bit of everything it. You can feel free to change the greens or fruit and add more or less vegetables according to taste. Toss all salad ingredients except avocado together in a large bowl with the dressing. Top with avocado.